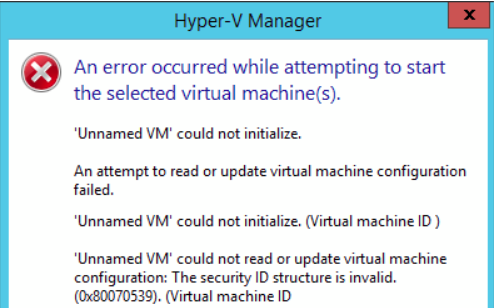 Resolving Hyper-v Error: “‘Unnamed VM’ could not initialize… The security ID structure is invalid.” | Chinny Chukwudozie, Cloud Solutions. While moving my Lab to a new environment using the Hyper-v Export and Import VM options, I ran into an “‘Unnamed VM’ could not initialize… The security ID structure is invalid” error when trying to start the Domain Controller Virtual machines. After doing some research, I found out that after a VM Import, Hyper-v doesn’t know how to handle an invalid or non existent security id or user that had been granted virtual machine screen access. This ID is referenced in the VM configuration file. I made sure to run the cmdlet in an administratively run powershell session. After running the cmdlet, the Domain Controller VMs started successfully. Running dcdiag showed the Domain Controllers in a stable state. I used the same process to move other VM’s running specific services, including Exchange Server 2010 and testing to make sure all required services are running using Test-ServiceHealth cmdlet. The process also helped test one of the options that could be used as a Disaster Recovery procedure if necessary. This entry was posted in Hyper-v, Hyper-v 2012 R2, Hyper-v Manager, Microsoft Hyper-v, PowerShell, Powershell 4.0, Uncategorized, VHDX, Virtual Machines, WIndows 8.1, Windows Server 2012, Windows Server 2012 R2 and tagged Cmdlets, Grant-VMConnectAccess, Invalid Security ID, Unnamed VM. Bookmark the permalink.